Floral Drapery Panels w/ Custom Accent Pillows - by Exciting Windows! Drapery panels, combined with matching top treatments, frame the window for an elegant backdrop. 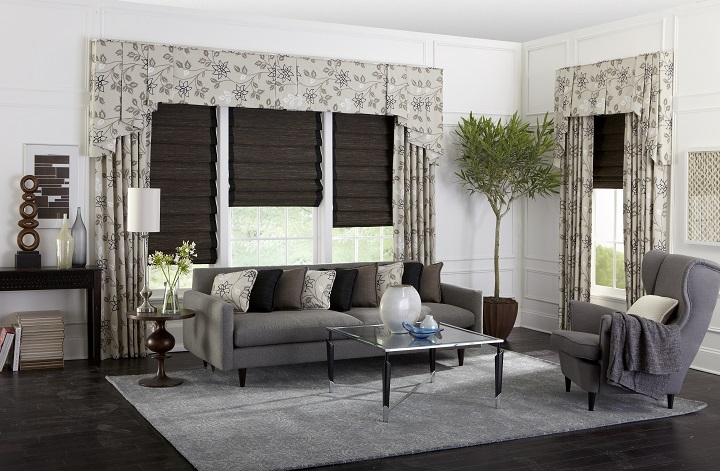 The dark Roman Shades, highlighted by the contrasting color of the window treatments, make a bold style statement. Custom Roman Shades offer benefits of light control and energy efficiency for a comfortable atmosphere. The full drapery panels offer optional layers of control for added benefits.